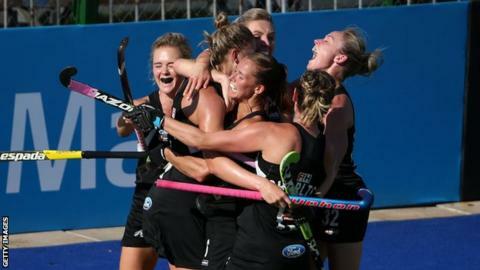 Britain's women are out of the World Hockey League Finals after losing their quarter-final 2-1 to New Zealand. GB fell behind to an impressive Anita Punt strike midway through the second quarter in Argentina. A clever video referral then helped Helen Richardson-Walsh level through a penalty stroke with six-minutes remaining. But with just a minute to go Olivia Merry forced a winner past GB goalkeeper Maddie Hinch. Seen as two evenly matched sides ahead of the fixture, in truth New Zealand were rarely put under any considerable pressure. GB were indebted to keeper Hinch, who pulled off a series of impressive stops to keep the score close. Goalscorer Helen Richardson-Walsh told BBC Sport: "Sometimes you can learn from results like this and I'm sure that's what we'll do." It is a disappointing end to what has otherwise been an impressive year for the team. Defeating Germany at the World League semi-finals in Valencia in June secured GB's place at next summer's Rio Olympics, whilst England claimed a historic gold medal at the European Championships in August. And captain Kate Richardson-Walsh has targeted a medal in Rio. "We started slowly but in the second half we improved and created some good moves but it wasn't to be," she told BBC Sport. "Nothing here will change our belief that we can challenge for an Olympic medal next year." "We need players to be here and go through these experiences. There are some players at home who also need to be here to get the experiences for Rio. "It's all very well making excuses, but international hockey is tough. The players now understand a little bit more about what this level is like. "The younger players now get the tempo of the game and the heat of the quarter-final format. They will probably play with a bit more nous and we won't let games get away from us." GB will play again on Saturday against South Korea, who lost 3-1 in their quarter-final against China. Germany play New Zealand and Argentina face China in the semi-finals on Saturday.